Check all monies and invoices have been paid. Check and inform the appropriate people of any travel arrangements, hotel accommodation and meeting rooms that you have booked. If you are having any speakers represent your company at any of the sessions make sure that they have travel and hotel bookings and that these have been confirmed. Check that they have been sent their seminar session information including session times, plans of the conference rooms and exhibition layout. Make sure that any staff who are due to attend and help have been sent details of the exhibition, including your stand number and hall. They will need to know what days and times they are attending and when to meet, and they will need a show plan. Have a conference call or meeting with everyone attending to run through the schedule of the show and what is expected from their participation. Make sure all staff to understand the objectives and goals you want to achieve at this exhibition. Prepare staff – make sure they have a complete knowledge of your company and its products and services, both current and new, and also that they know the relevant market trends and competition so that they are able to talk effectively with prospective customers. Run though pre-training required by staff and make sure they are familiar with any equipment, demonstrations or presentations that they will need to use or refer to. Run through the process of lead collection and allocate staff in the home office to follow up these appropriately as soon as possible after they have been generated. Make an inventory and pack items to be taken to the show, such as literature, give-aways and lead forms as well as equipment, software and stock. These can often be delivered to the show by the stand builders or by using the services of a transportation freighting company. Make sure that if you are exhibiting in a non-EU country that you have filled out the correct customs forms for clearance and re-entry back to your home country. Confirm that freight has arrived and all contractors are on schedule. Check that you have sent out badges or passes as required. Prepare an exhibition handbook with all information about the exhibition and your company’s participation, as well as supplier contact and names. Plan to travel out during the build-up of the stand to make sure all is running to schedule and that you are there to supervise the stand build. Take photo of stand before show opening. This entry was posted in Exhibition pre show logistics, Planning for exhibiting at a trade show, Pre planning and Management of logistics, Tips how to Exhibit at a Trade Show, Tradeshow check list, Tradeshow Time Lines and tagged Business Events, check list, Corporate events, Event management, Exhibitions, invitation process, Tips on October 3, 2016 by b2beventmanagement. Final check all travel/accommodation arrangements and information to arrive exhibition in time for the build up. This entry was posted in Exhibition Marketing plan, Exhibition pre show logistics, Marketing material for Exhibition stands, Planning for exhibiting at a trade show, Pre planning and Management of logistics, Tips how to Exhibit at a Trade Show, Tradeshow check list and tagged Business Events, Corporate events, Event management, Exhibitions, Successful events on August 31, 2016 by b2beventmanagement. promote your stand, brand, business, services, products and expertise. The key to successful promotion is to use the right combination of strategies. First you will need to know what your objectives are for exhibiting at the trade show in order to determine which forms of marketing suit your promotion. To get any attendee to your stand they need to perceive value, have an experience, or learn in some way. You will need to make sure you have a targeted and up‐to‐date database of contacts. of why they should visit your stand.  Database mailshots with phone follow‐up. describe the hospitality you’ll offer on the stand. opportunity when talking to clients, prospects and third parties. correspondence you send out. You can also use giveaways to promote the event. sending updates to them about what is happening. an additional line on the signature, specifying the stand location and number. corporate website under a specific tab heading of events. engage with potential prospects before the event. body of each tweet and is a short phrase preceded by a hash (#) symbol. By making a hashtag that is short and easy, other tweets can reference your conference using the tag. your related publicity – don’t wait until the day the event starts! will be a keynote speaker. Include hashtag in all print and digital material. conference and a pitch about the conference. seconds. There are a variety of developers of mobile apps such as CrowdCompass. means measurable results for your exhibitors and sponsors. between the company and attendees. be created for most smart devices such as Android, iPhone, and iPad. attendance known so that those coming to the show know of your presence and want to visit your stand. It does not matter how good your stand and products are if you don’t get footfall and generate leads to your products. This entry was posted in Exhibition Marketing plan, Marketing material for Exhibition stands, Marketing you exhibition attendance, Planning for exhibiting at a trade show, Publicising your exhibition attendance, Tips, Tips how to Exhibit at a Trade Show, Trade show marketing and tagged Business Events, communication with invitees, Corporate events, Event management, Exhibitions, invitation process, invitation to an event, Marketing, Marketing events, Marketing mix, promotion of an event, Successful events, Tips on August 16, 2016 by b2beventmanagement. Your marketing and publicity should be part of your whole marketing plan for exhibiting. Trade shows are a powerful element of the marketing mix in that they enable you to have face to face conversations with your customers and prospects, and to gather sales leads. Your business and brand needs to be known to potential customers who are attending the trade show. The attendees will gravitate towards the brands that are familiar, visible and readily available to them. You want as many of the right kind of attendees to come to your stand. You need to ensure that you meet the right people, set up productive meetings and drive traffic to your stand. To do this you need to make sure that your marketing is targeted to the right attendees: those who will be interested in your products and who could potentially lead to a sale. Depending on your budget there are different types of marketing and ways of promoting your exhibit at a trade show. Some are free and others are chargeable. There are also different ways of marketing and promoting your presence at a trade show. We will look at the various ways of promoting your event in this tip blog and then in the next blog tip we will look at the different types of traditional and on-line marketing that you should consider using. When you start the planning process you need to finalise the theme of the exhibition. All the marketing and communications of the company exhibition and promotion should have the same branding and look-and-feel. All communication about the exhibition should make consistent use of the appearance and branding. If you are highlighting new products then the communications and graphics should reflect the same graphical design. The marketing of your exhibition is not just about the promotion of the stand and brand but it is also integral to promoting your business, services, and expertise. Whatever marketing methods you adopt make sure you measure the results. This is so that you can determine the most effective method of getting people to your stand and so that you can analyse your Return on Investment (ROI). Make sure that all your promotion is highly focused and correctly targeted. Consider all possible methods of communication because different people like to receive communication in different ways. Use the full range of traditional offline promotion as well as online promotion and social media. Promotion of your company in their catalogue of exhibitors. This usually requires a short abstract about your company, what it is that you are promoting, a list of products, photos of the products, and stand location and contact details. An entry onto their website again listing your company products and contact information. Remember products can be searched and products cross-linked. PR article for their newsletter promotion. Advertising on website or pre-event magazine. Sponsorship opportunities. These will be chargeable, but your brand or company name will be promoted on banners, on part of the website, on promotion media and at the exhibition. Taking advantage of speaker opportunities that may arise if the trade show is running an educational seminar or is associated with a specific conference connected to the market segment into which you are marketing. Use the trade show logo on your in-house marketing material and emails to advertise that your company will be exhibiting. In summary you need to use the best method of promoting your trade show attendance to your market and potential customers. The main point is to make your attendance at the show known so that those coming are aware of your presence and want to visit your stand. It does not matter how good your stand and products are if you don’t get footfall and generate leads to your products. This entry was posted in Corporate Reasons for Exhibiting, Exhibition Marketing plan, Marketing material for Exhibition stands, Planning for exhibiting at a trade show, Pre planning and Management of logistics, Tips, Tips how to Exhibit at a Trade Show and tagged Business Events, Corporate events, Event management, Exhibitions, invitation process, Marketing events, Marketing mix, offline promotion, promotion of an event, research of attendees, Successful events on August 3, 2016 by b2beventmanagement. Once you have prepared your strategy and objectives for attending an exhibition, completed the trade show Marketing Plan and prepared the budget you will know how much money you have to spend on the exhibition stand and the graphics. Following on from the last blog we will concentrate on Space only bespoke booths/stands and the related graphics for stands. Space only hire of floor space is best for making a bigger impression by allowing a bespoke stand to be designed and built to your own specifications. It is very important for your exhibition stand to give the right impression in order to showcase your brand, company and products. Confirm with the stand designer and builder that they will give you full management control from concept to completion. The stand building company can also transport and erect the stand before the exhibition, and then afterwards de-rig and transport the stand back to your company or keep it in storage. Decide if you want to hire the stand for a one-off exhibition or if you have quite a few exhibitions you are attending. You may want to purchase your own stand and reuse it. Make sure that the company can store the stand and refurbish it as required. There will be an additional cost for this with each exhibition but the overall cost should be less than if you were starting from scratch each time. Know your budget for each component of your exhibition project. It is important that the stand designer also keeps within budget that there are no hidden costs. The stand designer needs to understand your company ethos. The designer needs to know what it is you will be exhibiting whether hardware or software, retail items etc. The designer needs to know what you would like included in the available floor area, like a small meeting room, storage, presentation area, demonstration area, reception information desk etc. The designer needs to know your marketing theme, what look and feel you would like at the exhibition, and whether it needs to follow your brand marketing or promotion. The designer needs to have an idea of the graphics you would like and how these will fit onto the stand walls etc. Research the stand designers and decide what designs in the past they have done that you like and whether they have used the materials you are thinking of using for your stand. Get examples of previous successful stands that they have created so you can refer to them in your brief. Make you brief as full as possible including what you want to achieve so that the stand designer and builder can respond as closely to your requirements. Send out briefs to no more than three designers; any more becomes overkill. Get a design agency or marketing department to design what you want to say about the brand and incorporate into the graphics. Keep to corporate colours, logo and trademark for your brands. Promote the key brand that you are there to exhibit. Keep graphics simple and visual; too much information looks messy. Remember the audience are walking past and they need to know what your company does or products you sell, as easily as possible. This entry was posted in Corporate Reasons for Exhibiting, How to budget for a trade show, Planning for exhibiting at a trade show, Tips, Tips how to Exhibit at a Trade Show, Trade show graphics, Tradeshow stand design and tagged Corporate events, Event management, Successful events on July 18, 2016 by b2beventmanagement. From the outset you should have an idea of what type of exhibition stand you want and what you can afford from your budget. Some exhibitions are part of a conference where you either get a table and chair or can have your own pop up stand. 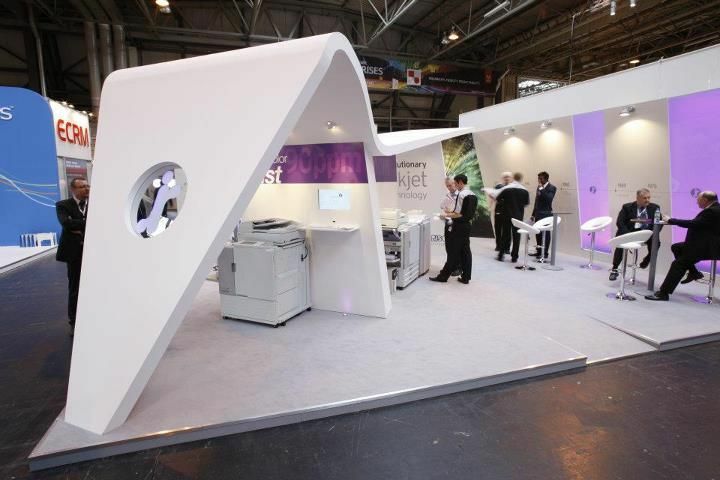 If you are exhibiting at a trade show you may have a choice of a shell scheme or freestanding space. The size of the shell scheme can vary depending on your budget but they normally have set dimensions. Most purpose-built shell schemes usually have three walls with standard furnishing. Some are corner stands with two walls or a free standing space of a specific size where you can design and build your own bespoke stand. The choice will depend on the type of show, the schemes available, your budget, and what it is you want to showcase on the stand. Table and chair. This format can be rather limiting but you can usually use floor-based pop up banners as a back drop or table-based pop up. You can promote your company name, product or message on the pop up. There are a variety of pop up banners which come in different width. Single or double sided banners are retractable, easy to carry in a case and are available in a variety of prices to suit your budget. If you are going to be using the banner at a number of events it is probably best to have a more expensive durable one. When paying for a table and chair an electrical connection is normally included along with your company name exhibition entry. One graphic option is to use Foamex display boards which are inexpensive and can be attached to poster boards. Portable Pop Up Stand. If you want something a bit more custom-made then a pop up stand is useful. Again it can be re-used and comes with its own travelling boxes. Varieties of modular exhibition stand with interlocking components can be found online at different prices. They vary in size and can be single or double sided, straight, curved or L shaped. They usually have a magnetic locking system to hold the panels together on tubing which is used for rigidity. The company branding and messages can be placed on the banner sides. Ensure when putting away your stand that you pack the rolled graphics the right way to prevent them from getting scratched. If using spotlights always carry extra bulbs and if exhibiting abroad make sure you have a European socket converter for an English plug! Shell schemes are used at most major conference and event centres as a way of dividing hall space into individual sections or booths. Shell schemes are usually formed by a series of upright aluminium posts braced apart with cross-beams. The shell scheme normally has three sides but you can get a two-sided stand. The size of the shell will depend on the trade show floor plan. Shell schemes normally come with flooring, company name board, lights, basic furniture, and electric power. If more furniture is required you can order these from the trade show organiser. To make your company stand out from other exhibitors use creative graphics and think of innovative ways to decorate the stand or shell scheme so that you are differentiated from the crowd. Solutions include using free-standing display stands and banners or attaching posters or panels to the walls of the stand using Velcro. The problem with exhibition shell scheme systems is that the aluminium uprights stand proud of the wall panels. This causes problems when you want to create a large seamless back wall display rather than having a series of posters separated by the aluminium shell scheme uprights. The Shell-Clad system provides a good solution for those who want to achieve maximum impact by decorating a shell scheme exhibition stand with edge to edge, mural-style wall graphics. It provides a simple yet ingenious way of attaching graphic panels to the shell scheme posts without the need for sticky tape or other messy fixings. Shell-Clad adapters’ clips simply snap on to the upright pillars of the shell scheme and provide a Velcro-compatible surface onto which graphics can be attached. Panels for the Shell-Clad system are normally produced in vertical strips using a durable, laminated, rollable material. This means that in most cases your exhibition graphics can be rolled and transported in a single box or storage drum. Printdesigns is an example of a print company that produces panels for Shell-Clad exhibitions stands. In addition stand standard roll-panels Printdesigns can use materials like Foamex PVC or even dye sublimation printed fabric to create exhibition wall graphics for your stand that look good and are compatible with Shell-Clad adapters. Normally the print company will provide both an artwork template and a plan of your stand to make it easy to design graphics and fit them later. This entry was posted in Corporate Reasons for Exhibiting, Exhibition stand location, How to budget for a trade show, picking best trade show booth location, Planning for exhibiting at a trade show, Tips how to Exhibit at a Trade Show and tagged Business Events, Event management, Exhibitions, planning budgets for events, Successful events on June 20, 2016 by b2beventmanagement. Having already prepared your strategy and objectives for attending an exhibition as well as completing the trade show Marketing Plan, you now need to produce a working budget. The budget needs to be flexible and, as a guide, the trade show cost is normally three times the cost of the exhibition space. Setting the budget is important to ensure you have funds that are sufficient to fulfil the exhibition’s objectives and to make sure that the exhibition is delivered to the right standard. The details of how to set a budget are discussed below. – Fixed costs which are normally around 60% of the total budget. – Variable costs (for example, supplier costs). This is normally around 25% of the budget. – Calculate a reasonable contingency of around 15% of other budget costs. – Review your costs regularly. It is most important to establish budgetary control of costs at the beginning of the project planning. This will enable you to know where you are with the on-going costs during the build up to the exhibition. You may find you are able to add enhancements to the stand or you may need to cut back on planned expenditure. These costs need to be covered regardless of the number of attendees or size of an exhibition. 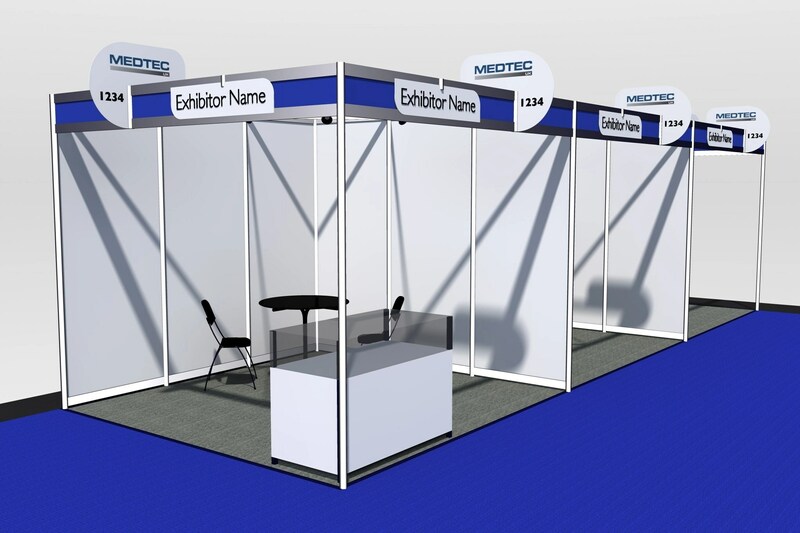 Dependent on the type of exhibition stand they normally include exhibition floor reservation and associated payments to the exhibition organiser, the stand build, and furniture which probably makes the largest proportion of the costs. Exhibiting charges due to the organiser for floor space only or a shell scheme, online marketing entry, exhibition brochure promotion, logo, sponsorship, badges, and storage space. Stand build – the design of exhibition stand and associated costs, the set build or refurbishment of a pre-existing stand, flooring carpets, backdrop, furnishings, graphics, banners, and lighting hire and installation. Supplier costs for furnishings, hire of equipment, such as PC or demonstration equipment, products, lead collection, scanner hire, hostess, photography, security etc. Audio Visual – such as screen, projection, video, camera recording, and laser projection. Sound if using for presentation on the stand to include – speakers, microphones of all types, CD player, mixer, cabling, adaptors, music etc. Speaker support – design, image production, animated images, script writing, and training rehearsals. Crew – you may need to allow for the costs of people for design and equipment hire, installation, freight transportation, rigging and de-rigging and all the technicians for any equipment used in the exhibition (as listed above). You may need to allow for per diem allowances for the exhibition crew too. Fees and Insurance – this includes event management fees if an agency is being used to help with exhibition management or logistics. You may also need to pay for equipment insurance, or event insurance to cover public liability etc. Print costs for direct mail. Any advertising, posters and promotional costs. Follow up activity to boost attendee response. Hospitality costs – This can include both on-site hospitality on the stand, such as food and drinks, and off-site hospitality such as a dinner or a party for your clients and prospects during the exhibition. Meeting room hire – if required during the exhibition for private meetings with clients. Normally you will have to pay a deposit on the room hire when booking for the event with a sliding scale of payment to be made as you approach the event. Note that some conference centres do not always include the same services as hotels and these can sometimes be an additional charge to the room hire. Set up Services – this can include supply of electrical facilities, power, waste disposal, cleaning of the stand, Wi-Fi Access and telephone. Always check exactly what services are included and for what period they are offered. These are usually the smaller proportion of your budget and will be dependent on the number of staff and attendees that you expect to attend. It is impossible to be absolutely accurate on your variable costs as exhibitions are dynamic events and constantly change. This is why it is important to create a workable budget in the early stages of your planning. Past historical documentation can be valuable when looking at numbers and previous costs. The variable items need to be checked carefully if the budget is to be kept under control. Always build in at least an extra 15 % of variable and non-variable budget costs as a contingency budget for the unexpected, such as additional drinks, crew overtime, additional catering, and unforeseen hire costs etc. You also need to put in here any currency conversion fluctuation that you may need to cover. This entry was posted in How to budget for a trade show, Planning for exhibiting at a trade show, Pre planning and Management of logistics, Tips, Tips how to Exhibit at a Trade Show, Uncategorized and tagged Business Events, Corporate events, Event management, Exhibitions, Successful events, Tips, tips on event budgeting on June 9, 2016 by b2beventmanagement.